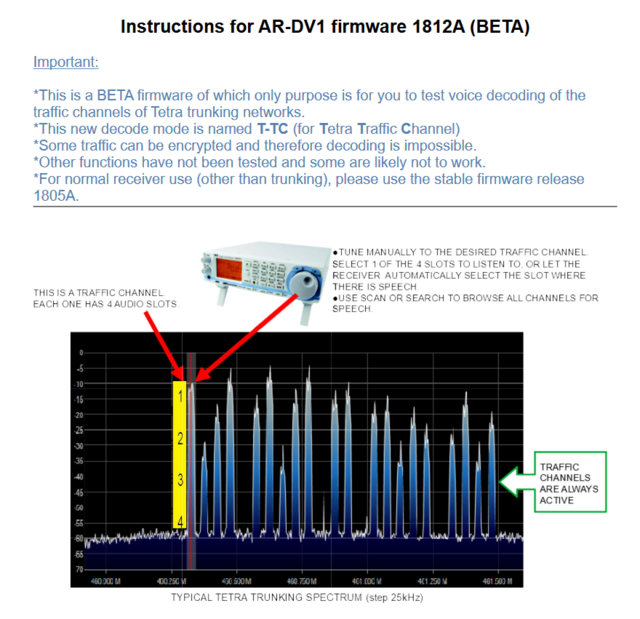 I just read today here viewtopic.php?f=4&t=6571 that the AOR AR-DV1 scanner can now decode trunked tetra along with the original DMO tetra it was only capable of. ok so i have took the memory card out of my AR-DV1 and formatted it. i know most if not all of this band is encrypted but its where i will head first. who knows ? dont know what to expect here ? OK so i had to nip out but am back to try it. with nearly 100 views on this post since i first posted i was hoping to have at least one response ?? Alfie wrote: OK so i had to nip out but am back to try it. with nearly 100 views on this post since i first posted i was hoping to have at least one response ?? I disagree with the statement by AOR that only the traffic channels are on permanently. That may be the case in some countries, but in the UK I haven't noticed ANY Airwave transmissions that come and go, they are all on permanently. Most airwave sites use two frequencies (providing seven talk channels plus the control channel). In busy urban areas I've found up to eight frequencies (e.g. on an office block in Yardley, Birmingham - that's 31 talk channels plus the control channel - though some may be directional). It's very rare to find just one frequency in use (e.g Beddgelert in Snowdonia - there is just one blatantly obvious antenna on the roof of the Royal Goat Hotel). The easiest way to tell which frequency carries the control channel is to use an SDR to spot the very brief data pulses on the input frequency. Alfie wrote: ok so i have took the memory card out of my AR-DV1 and formatted it. It's not the band that it encrypted, it is individual talk groups. As Airwave is also used unencrypted, some of the data must be unencrypted in order to allow those users to work. Does the AOR provide any such open data, such as the site number? Airwave Extended mobile 410.0125-411.9875 and base 420.0125-421.9875 but only in London. There are some unidentified signals in top 4 or 5 of those channels outside London (e.g Midlands), but never identified where from. They do not look like normal Airwave signals, but do seem to be on 25k channels offset by 12.5k. Highlands Council Highways are reported to use Airwave as it was the cheapest way of achieving coverage considering their topography, don't know if encrypted or not. I know there's not much range in TMO handheld tetra sets, however a fair few 'event' medical companies like to look cool and use old tetra sets on dmo tg01 programmed into them (think around 433) - so if theres something close and you cant find a medical channel on the normal event freqs, then this may be it. Have it up and running here, plenty of encrypted Airwave, Heathrow Trunked and various users sprinkled around the UHF bands.. 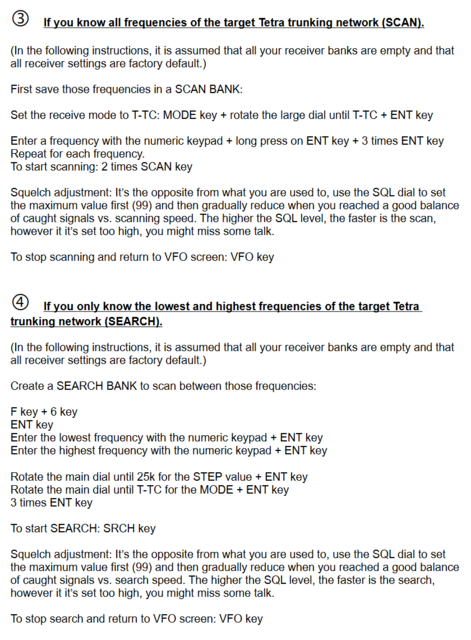 In use you only see the active frequency and Talkgroup (1-4) displayed - no other info..
first thing to say is everything here is encrypted and sounds like klingon/bubble and squeak. there is a lot of activity in this band as you can expect. control channels that transmit constantly but have intermittent speach. i will post an audio sample if anyone wants ? 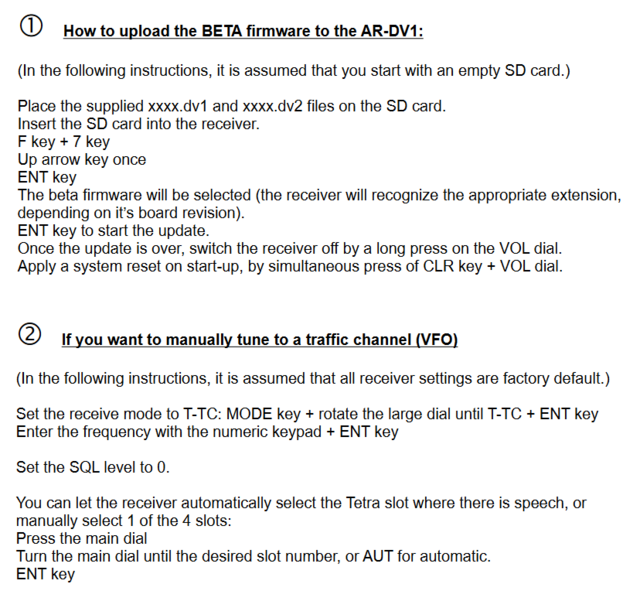 sure i remember hearing that tetra could not be decoded as it needed authentication but it looks as though that claim was wrong as aor is decoding it even if not unencrypting it. it looks hopeful as for the first time i have heard it decoded other than noise even though its encrypted. i wonder if an unencryption option might be available in the future ? so i will leave the airwave 380-395MHz band as though it decodes i now see for myself that all is encrpted there. its the main thing i and most people want to listen to but we have to face it that we may probably never be able to listen to the blue lights again. though this aor upgrade gives hope. found a lot of activity on 423 MHz but i have left it on for ages but not had any decodes. can anyone confirm this band is tetra ? for example frequency 423.9625 ?